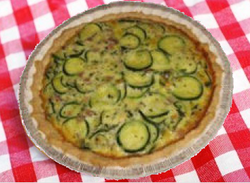 Many years ago, I found a fantastic Zucchini Pie recipe! But, I had to modify it to suite my family's tastes. Some of us are Vegetarian, while the rest of us prefer some type of meat in this pie. For years afterward, I had to bring two pies to every gathering, given the hint that they might not welcome me without them. Feel free to adjust the ingredients to suite your own tastes. I hope you find this recipe very versatile! * 3 C. Shredded Low Fat Mozzarella Cheese Or your favorite Low Fat Cheese blend. 1. Sauté the zucchini and onions in butter (or light extra virgin Olive oil). A few minutes before removing from heat, stir in Parsley, Pepper, Garlic, Basil and Oregano. 2. Combine beaten eggs and cheese in a large mixing bowl. Remove the zucchini mixture from heat and stir into the egg and cheese. As the hot mixture settles, skim oils (from butter & cheese) off of the surface. If the mix is too wet, it won't cook evenly! Taking the time to do this now will save you in the end. 3. Line a 10" pie pan with crescent rolls, pinching the edges together to form the crust. Spread a thin layer of mustard over the crust. Pour the zucchini mixture into this prepared crust. 4. Bake @ 375ºF for 20-25 minutes in a preheated oven. Or until golden brown and a light crust has formed. Let it cool for 10 min. before slicing. Cover the crust with aluminum foil strips, or a pie crust shield, to prevent burning during the last 10 min of baking time. * For NON-VEGETARIANS: Add (pre-cooked/chopped) 1/4 C. Canadian Bacon, smoked Ham, white meat Chicken/Turkey, or hot/mild Sausage to the mix, just before pouring it into crust. * Test for doneness, using a tooth pick. If you find that the center hasn't fully set, after 20-25 minutes @ 375ºF, reduce the temperature to 150ºF and continue cooking for an additional 10 minutes or so.